Discussion in 'Interior/Electronics' started by Ivey, Jan 24, 2019. Has anyone purchased the moulded carpet off rock auto? I'm curious if it's any good. $150 for their medium grade carpet with backing seems like a decent price. I think someone here did just cant remember who. I ordered molded carpet from some one years back, not sure who , it fit fine. I think this is what the PO installed in my truck. I don't know which pile type or backing though sorry. Here's a pic from my media gallery, you can kinda see where it cuts off on the firewall. Can take more/better pics if needed. pic isn't coming in though. You can't see that pic? You can also go to my media gallery and view the pic from there. You could easily just pickup some matching carpet and do that section yourself. 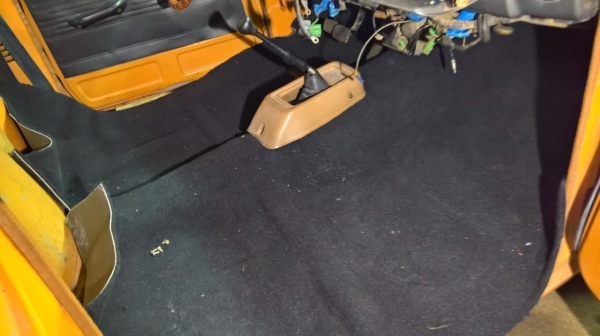 No idea what an upholstery shop would charge to do the whole interior's carpet, but I'd guess $300 minimum just based on how many hours it might take. I've thought about doing the back wall and what I'd do is install sound deadening sheeting (dynamat/other) first, then make a backer board template from upholstery board/masonite, adhere the carpet so it wraps around the edge cleanly, then install it with magnets or velcro to the back wall instead of making holes for fasteners. Oh I found it in your gallery. I see what you are saying about the firewall. I feel like my current vinyl cuts off around there. Looks nice though, I probably will spring for it once I find a pair of seats that work. I payed just a little under $250.00 for carpet, dynomat and sound foam/fabric for the full truck including the back and headliner. Also had enough dyno to put on the ceiling and the doors. I bought the carpet from an upholstery place and the sound fabric. For the floor I bought an aftermarket product like dynomat but cheaper and thicker it worked great cause I also used the foam/fabric to help with road noise. Hope this helps your install. I bought the rock auto carpet (which is https://www.accmats.com/) and it fit onto the trans hump and seat mount bumps perfectly. It also had a lot of extra around the perimeter, allowing carpet WAY up the firewall (up into the clutch pedal fire wall bracket). That extra is nice, but it also needs to be carefully trimmed around the sides and back. That looks great Dan! Right now I'm waiting for a dry spell so I can POR15 my floor pan and install carpet. Which version did you spring for?